(Phys.org) -- Although oceans and seas contain about 97% of Earths water, currently only a fraction of a percent of the worlds potable water supply comes from desalinated salt water. In order to increase our use of salt water, desalination techniques must become more energy-efficient and less expensive to be sustainable. In a new study, two materials scientists from MIT have shown in simulations that nanoporous graphene can filter salt from water at a rate that is 2-3 orders of magnitude faster than todays best commercial desalination technology, reverse osmosis (RO). The researchers predict that graphenes superior water permeability could lead to desalination techniques that require less energy and use smaller modules than RO technology, at a cost that will depend on future improvements in graphene fabrication methods. The scientists, David Cohen-Tanugi and Jeffrey C. Grossman of MIT, have published their study on water desalination using single-layer nanoporous graphene in a recent issue of Nano Letters. This is not the first time that researchers have investigated the use of nanoporous materials for desalination. In contrast to RO, which uses high pressure to slowly push water molecules (but not salt ions) through a porous membrane, nanoporous materials work under lower pressures and provide well-defined channels that can filter salt water at a faster rate than RO membranes. However, this is the first time that scientists have explored the potential role of nanoporous graphene as a filter for water desalination. Single-layer graphene, which is just one carbon atom thick, is the ultimate thin membrane, making it advantageous for water desalination since water flux across a membrane scales inversely with the membranes thickness. Using classical molecular dynamics simulations, Cohen-Tanugi and Grossman examined the water permeability of nanoporous graphene with different pore diameters (1.5 to 62 Å2) and pore chemistry. As previous experiments have demonstrated, nanopores can be introduced in graphene by a variety of methods, including helium ion beam drilling and chemical etching. In their simulations, the scientists strengthened the nanopores by passivating, or shielding, each carbon atom at the pore edge with either hydrogen atoms or hydroxyl groups. The scientists compared the two chemistries, along with different pore sizes, of nanoporous graphene in their simulations by running saltwater with a salinity of 72 g/L over the membranes, which is about twice the salinity of average seawater (about 35 g/L). They found that, although the largest nanopores could filter water at the highest rate, large nanopores allowed some salt ions to pass through. The simulations identified an intermediate range of nanopore diameters where the nanopores were large enough to allow the passage of water molecules but small enough to restrict salt ions. 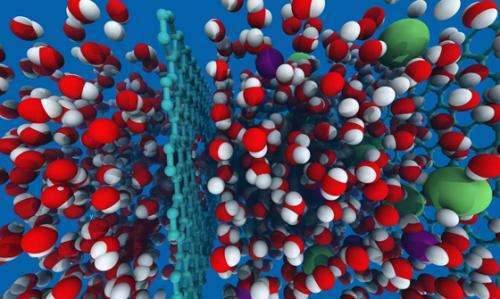 The simulations also showed that the hydroxylated graphene significantly enhances the water permeability, which the scientists attribute to the hydrophilic nature of the hydroxyl groups. Since, in contrast, the hydrogenated pores are hydrophobic, water molecules can flow through only when in a limited number of highly ordered configurations. But hydrophilic groups allow water molecules to have a greater number of hydrogen-bonding configurations inside the pores, and this lack of restrictions increases the water flux. 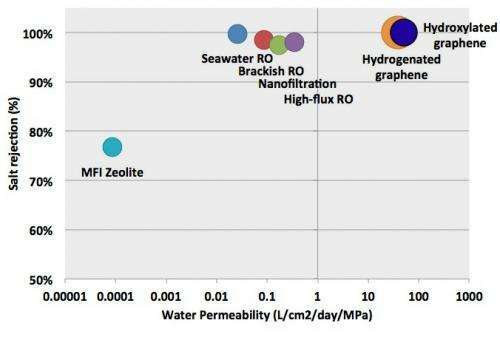 Overall, the results show that nanoporous graphene can theoretically outperform RO membranes in terms of water permeability, which is expressed in liters of output per square centimeter of membrane per day and per unit of applied pressure. 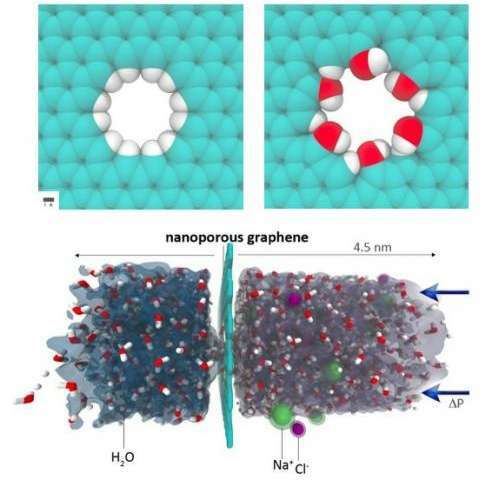 Whereas high-flux RO has a water permeability of a few tenths, the simulations showed that nanoporous graphenes water permeability ranged from 39 to 66 for pore configurations that exhibited full salt rejection (23.1 Å2 hydrogenated pores and 16.3 Å2 hydroxylated pores). Graphene with the largest hydroxylated pores reached 129, but allowed some passage of salt ions. The scientists explain that there are two main challenges facing the use of nanoporous graphene for desalination purposes. One is achieving a narrow pore size distribution, although rapid experimental progress in synthesizing highly ordered porous graphene suggests that this may soon be feasible. The other challenge is mechanical stability under applied pressure, which could be achieved using a thin-film support layer such as that used in RO materials. effective water desalinization is hands down going to be the biggest breakthrough in the world if and when it happens. it' definitely the key to many many issues. from water, comes food, comes life. If this is made, then humanity can only benefit. I notice the vote thus far stands six votes made, all for max stars. That's good, overall: now if only policy makers would stop politicizing everything. We really need the ability to produce graphene on large scales. That should have top priority right now. With all the simulations and experimental evidence as to its uses that would radically change so many fields. And, it would provide a ready market for reclaimed industrial carbon, providing a further market incentive for carbon capture technology installation. And since "ought to" -even for the continued survival of life on earth as we know it- clearly isn't sufficient reason for widespread adoption of the technology, the most likely way to get the job done is to create a market-based demand for the resource. Then the slobbering freemarketeers will be falling all over themselves to be the first on their block to get it up and running. Green isn't good enough until it is green(back$$$). We really need the ability to produce graphene on large scales. That should have top priority right now. You can almost guarantee its a priority some where to get that to happen. Graphene and computational material science FTW! Yeah -kind of. The thing that is holding back large-scale production of these very useful carbon compounds is a recognized market for them. As it stands now, no one knows for sure which application to build for. Sheets of graphene for solar? Chip sets? Nanotubes for filtration or waveguides? Buckyballs for? It's all about application, and nothing has emerged, to date, to serve as a launching place for any of this carbon-based technology- they are all still pretty much in the R&D/prototyping stage of development. There is a story making the rounds in the science related popular press about how a new method of making graphene more cheaply and easily for labs. I don't know how well it will scale up for industrial use but it sounds promising. There are also some other techniques being investigated, some of which might work synergistically with these filters. It may come to pass that one method is better for reducing salt content with another being more practical at getting to pure water from water with lower salt content than full sea water. Then we could put them together in a two step process. What is the absolute minimum amount of energy needed to separate salt from water? The problem is that a substrate that would be perfect would also have a hexagonal shape and have the same distance between atoms as graphene. And the only substance that does that is... graphene. Anything else will either have a larger distances (silicon crystals or boron sheets) or will just not give you the hexagonal structure to grow on. Any way you do it you get stresses which destroy the regular structure. There may be a way with a multilayer subtsrate where the second layer down alters the surface properties enough to get a good substrate by evening out the stress. But that has yet to be constucted. Anyhow - epitaxial growth is too slow (and costly). A roll-on process would be preferrable. Efficient desalinization, hydrogen fusion, and relatively high-temperature superconductivity would in combination make a world that would be hard to recognize. I hope we see them all in my lifetime.. I think we will only see the first one in our time. What is wrong with a three layers of graphene at very low pressure? The holes may not overlap at the case of multiple layers. Their hydration energy and Gibbs free energy of mixing. It seems that there may also be a use for this in the sewage treatment plants to assist with final filtering of heavy metals and other sub-microscopic particles. Would it help allow us to use sea water and filter it into drinking water? Because even in the Uk we have hose pipe bans, if we could use sea water with cheap ways of filtering the water it would be end the issue of low rain levels we some times get... ? And if it is cheap - it can also help the v.poor countries in Africa too. I'm partial to the way the earth has been doing it for a long time. Evaporation and condensation. Any coastal area with sufficient thermal energy from the sun could produce a significant amount of potable water. The brine could be pumped a good way back out to sea with some kept for salt production. Sure, you can have some salt in a few applications, but most of civilization's potable water needs require the salt be removed. The big problem with seawater RO systems - besides the high energy inputs are the per-filtering and harsh chemical back-washes needed to maintain the membranes. A carbon based "membrane" is likely going to be even worse from a maintenance stand point. I note no discussion on maintenance differences and costs - which normally means all of this is still at the early conceptual stage of R&D. No matter what the fresh water source wells,springs,rivers,it will be tested and cleaned.This takes maintenance costs.Many golf courses have partial recovery systems for their irrigation needs,and more work should be done to make this method cheaper for larger farms. We need not begin arguing about this problem of water shortage,the medical costs of having substandard water makes this a moot point.